In every sport there are the audacious ones. The mavericks who defy all established norms and tilt at every windmill around, laughing all the way and spitting in the face of convention. Sports such as football have had more than their share of these zanies, such as Joe Don Looney, quite a lifter in his own right, who was into all manner of crazy stunts. - - Had Looney been an actor or a singer, he might have attained the fame of James Dean or Elvis. During the early 1960s, he was considered one of the most promising football players in America. This account of his life is more than a sports biography. It tells of an individual who was a free spirit, renaissance man, and rebel. 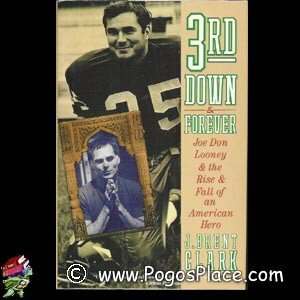 Looney's personal problems, from pressures on the football field to Vietnam to drug use, as well as his dedication to Eastern spiritual meditation, are skillfully presented by Clark, who interviewed hundreds of Looney's friends and relatives. At times, the constantly changing cast of characters makes for difficult reading. 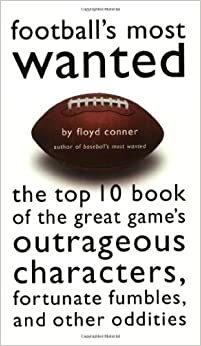 Yet Looney's guiding philosophy of always trying his best comes shining through in this story of a potential superstar who chose to operate outside of convention. Or Tim Rossovich of the Eagles who, for the hell of it, used to dive into the icy waters of Lake Michigan during the dead of winter to revive himself. - - If you are what you eat, Tim Rossovich was something else. He ate spiders, lit cigarettes, even a beer mug. He once challenged Mike Ditka to a bottle opening contest in which they used only their teeth - Rossovich won by the score of 100 to 3. You never knew what would happen when he opened his mouth. On one occasion a baby sparrow flew out. He never had any trouble being noticed, and liked to dress in a Dracula cape or a wizard outfit. He ran through the streets wearing only shaving cream. Rossovich often sunbathed with 'Unidentified Flying Object' written on his chest. He preferred to sleep face down on hotel room floors with a compass near his head, always making sure that his head pointed north so that the earth's magnetic waves would revitalize him. When not sleeping in his hotel room, Rossovich might be found standing on his head in the hotel lobby with his head immersed in a bucket of ice water. Other sports have had their own bad boys and behavioral oddities, and with the arrival of a pair of twin brothers from the East Coast, powerlifting and bodybuilding now have two such bad boys. Very strong bad boys. 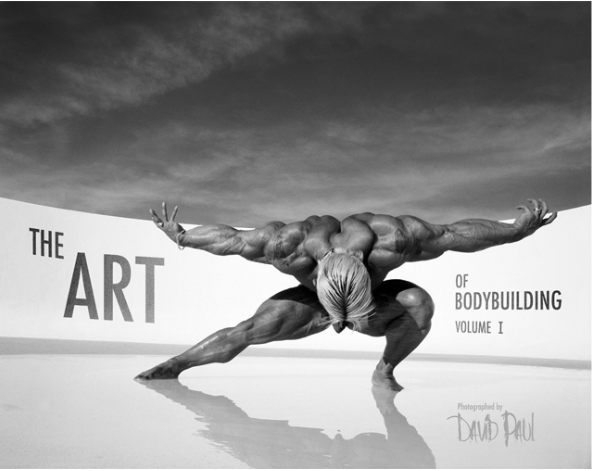 David and Peter Paul take great pride in in the fact that they have been featured by every leading bodybuilding magazine in the business but have yet to compete in even a local contest. They call themselves The Barbarians and have spent a lot of time and effort trying foster that particular image. The Barbarians are billed as the World's Strongest Twin Human Beings, and although this sounds about as credible as the World's Strongest Massage Parlor Owner, or the World's Strongest Beekeeper, the Barbarians are indeed two of the strongest, most muscular individuals I have ever had the opportunity to see. 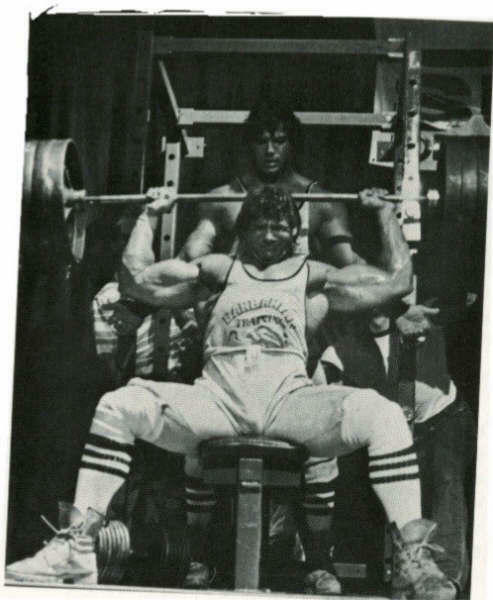 At the recent Body Expo held at the Disneyland Convention Center I noted among the luminaries (Pacifico, Bridges, Dennis Tinerino, John Brown and others) that there was going to be an exhibition of strength by the Barbarians. My initial response was, 'Just who are these two guys supposed to be, anyway?' I'm sure that the audience, many of them knowledgeable fans and lifters, and a lot of the guest stars reacted similarly, especially when the Barbarians came on stage declaring that they were goi8ng to break about 'five or six world records in one night'. They even had the nerve to say that they would repeat the same feats the very next night. Well, at least these two looked like they could press some big weights. My God, inhuman is the word for their physiques. The fact that they have only been training for about three years adds to their whole incredible nature. Each of them stands over 6 feet; both have immense body proportions which are tapered down to thin hips. 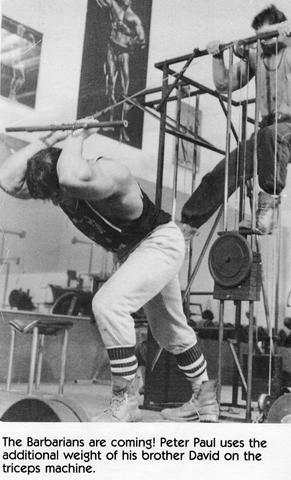 The first record to be broken was the bench press, but done in the reverse grip or knuckles forward fashion. For you brave souls out there, take on a set or two of these bench presses after your regular sets and you will find it a lot more than difficult. They put intense pressure on the wrists and the triceps and are a mind blower to say the least. David (their real names are David and Peter Paul,though they have gone by other less credible monikers such a Gorko and Kemo), started to warm up at 135 for an easy 10 reps or so. His brother, only a shade less thick than David,was at once spotting him and delivering a Reverend-like sermon on the benefits of 'Barbarian training'. The bar went quickly from 225 to 315 to 405, all smoothly done. 'Okay, people,' announced Peter, 'Now you will see my brother break the world record in the reverse grip bench press . . . are you listening out there, Terry Todd with your 500 lbs?' 'Hey, that's only 495,' yelled some wag from the audience. 'Close enough,' grunted Peter, and David went on to a hard fought, hips raised a bit, but finished 500 lb reverse grip bench press. 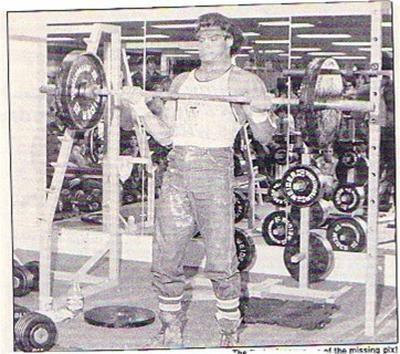 Peter then took to the weights as he cheat curled 235 for 15 reps, with the crowd chanting all the way. David was now at the podium, extolling the virtues of Barbarian training. single arm rows with 200 lbs for, GET THIS . 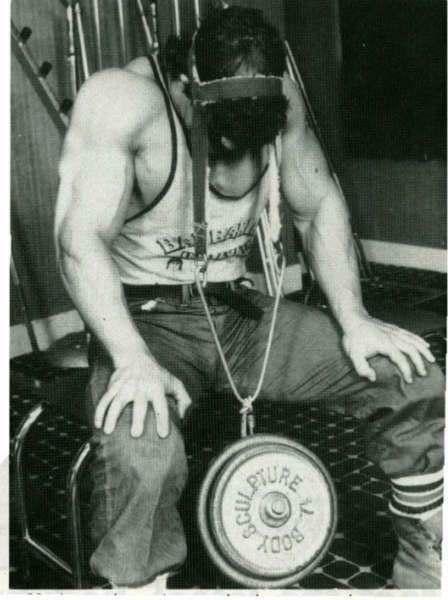 . . 60 REPS! Needless to say, they are also born comedians who delight in saying the most off-the-wall stuff that would make Redd Foxx sound like Senator Hayakawa. 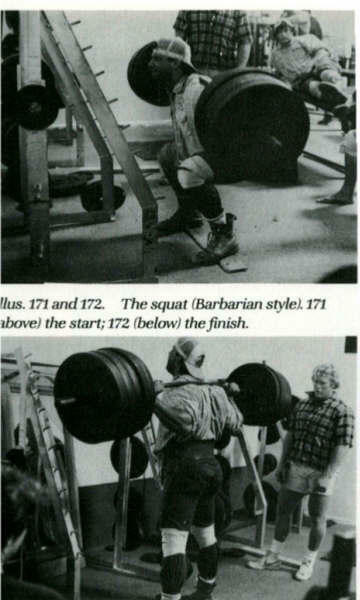 Some examples of the 'Barbarian' philosophy: David: 'I think that women's bodybuilding and lifting has gone way too far. The best examples of the ideal woman bodybuilder are Rachel McLish and Lisa Lyon. I think they should all train not for size but for symmetry like these two girls.' Peter: 'I don't. I think they should take all the steroids they can get their hands on and grow long underarm hair and a beard and get 20 inch arms like me.' David: 'If I was Mayor of Santa Monica I would line the beach with cops and refuse permission to anyone who had less than a 60 inch chest and 20 inch arms to even show their miserable skinny faces around.' Peter: 'I started bodybuilding when I was a little boy. I looked in the mirror one day and saw nothing but this big ugly nose. Because my parents were to poor to afford an expensive nose job I started to lift in order to build the rest of my body on par with my nose.' I could go on but my sides ache too much from laughing. 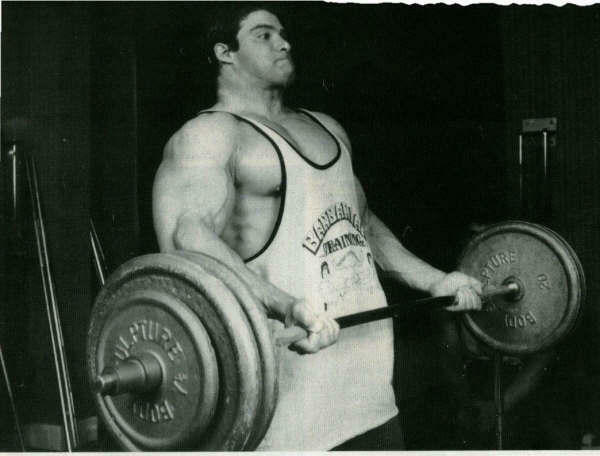 David told me that he wanted to issue what he termed the Barbarian challenge to anyone, in a lifting contest for either singles or reps including body movements for each body part (for example, a neck lift, chest lift, triceps lift, etc.). 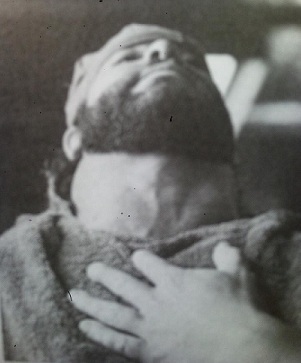 Apparently Roger Daggitt, the outstanding Canadian powerman, called David on the phone to challenge the brothers in the press behind neck, in which he has reputedly done a single in the neighborhood of 400 lbs. 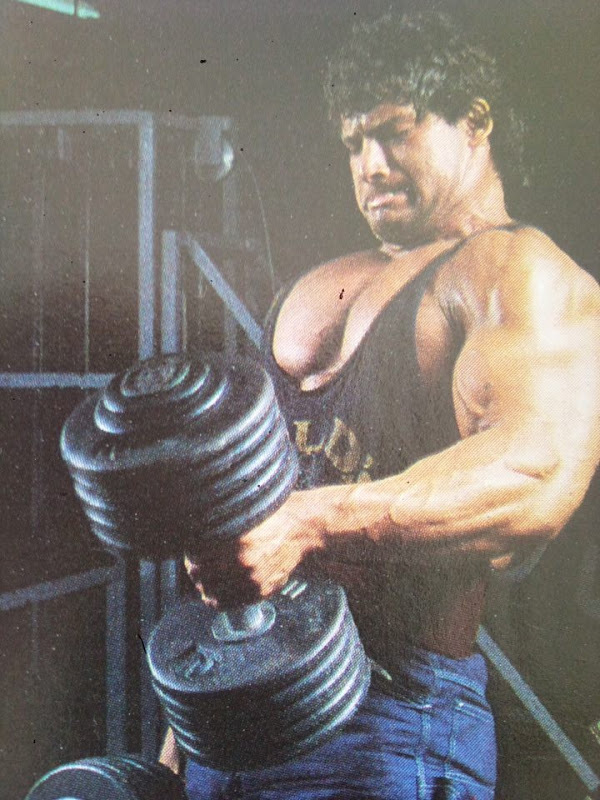 David's response was, "Well, I'll start the challenge by using 275 in the neck lift for reps. I'll let him start first and he'll break his neck and I'll win by default.' Bob Greaney, the manager/handler of the Barbarians, tells me that managing the boys is a never ending vista of surprises, including nightly calls from Peter in the guise of (voice-wise, at least) the trainer of champions Joe Weider; appearances at fancy restaurants with nothing on but their workout gear, no shoes, and plain white (or should I say dirty black) socks, etc. Bob is very cagily trying to market the Barbarians as show business novelties, not as bodybuilders or as strongmen. Apparently there is a plan in the works to 'go Hollywood' via acting and voice lessons etc. Hey, boys will be boys, but when they came over to my house for the interview I found them surprisingly soft spoken and rather well mannered (although I could see the evil look by wife was giving them for putting their feet up on the coffee table). 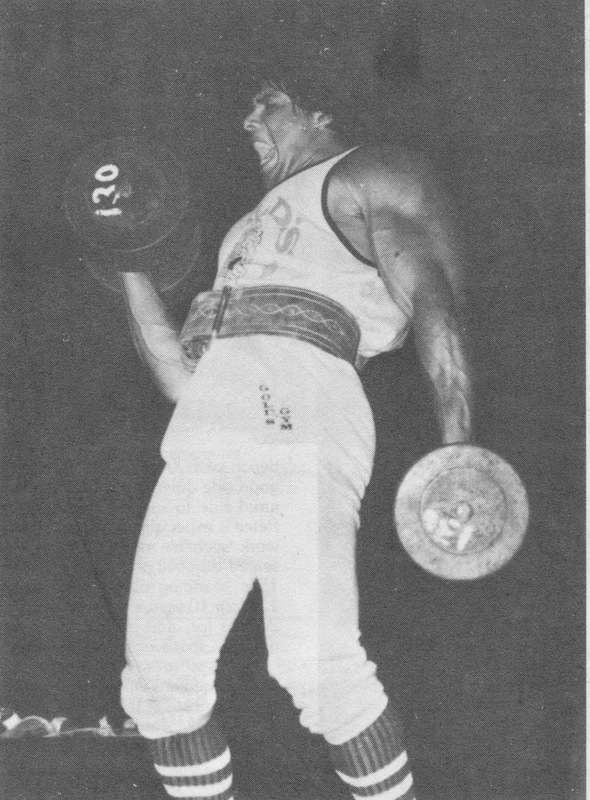 In regards to powerlifting they seemed to be quite knowledgeable on the sport, at least to the extent of knowing the top lifters on the scene; but even though their main claim to fame is their exploits in the upper body movements, they state quite emphatically that they 'squat like crazy using a very narrow stance and high reps with around 550.' 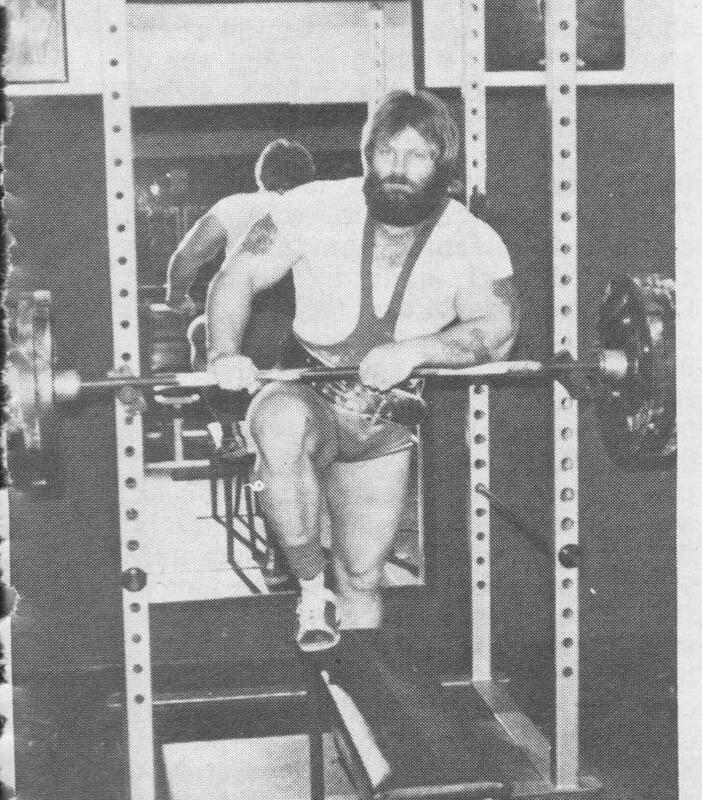 They readily admit that due to their small hip structures their success in moving massive weights in powerlifting would not be as effective as, say, Mike Bridges who has more ideal body leverages. 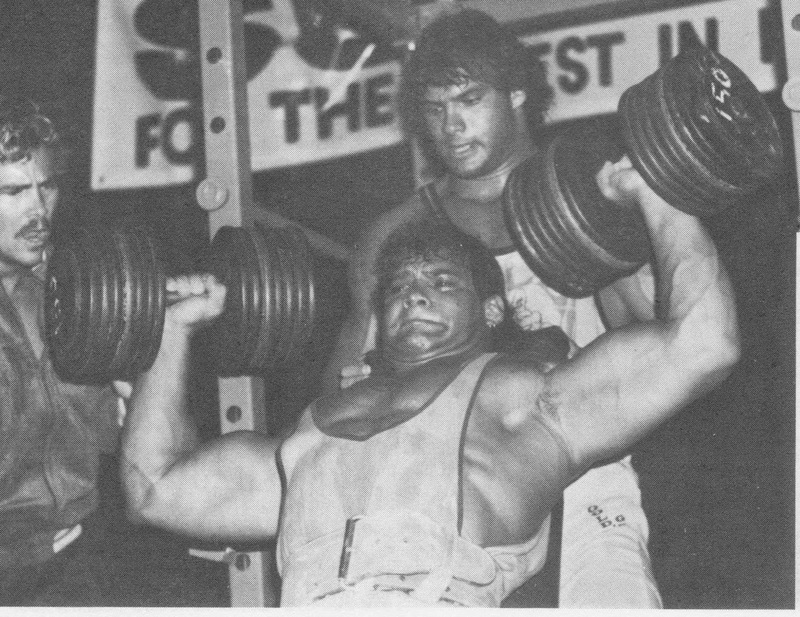 However, they claim that no one is as strong on the bodybuilding movements for reps as they are. Regarding their diet, they drink a lot of raw carob milk shakes, adding it to anything else they can get their hands on and their daily dietary intake would probably make Clarence Bass want to drown himself in a bodyfat immersion tub. Six, sometimes eight thousand calories a day are the norm. They usually go over to Weider's and cart away a few pallets full of supplements and protein. 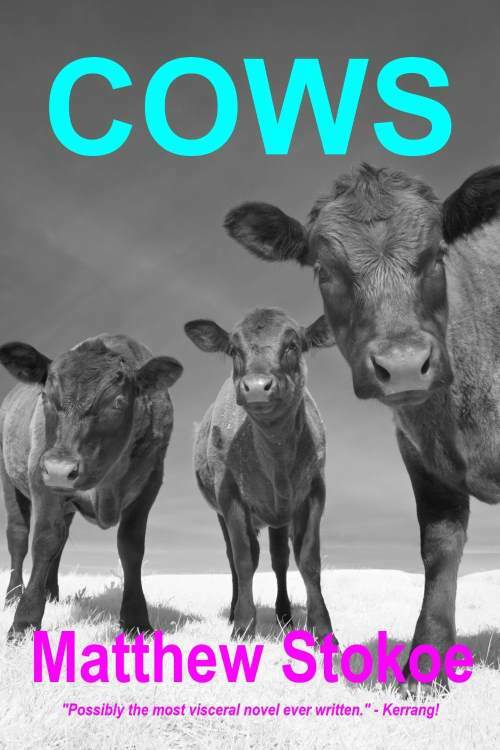 Rumor has it that they hang around the slaughter house and when the foreman is looking the other way, nab a few extra heads of cattle. At any rate . 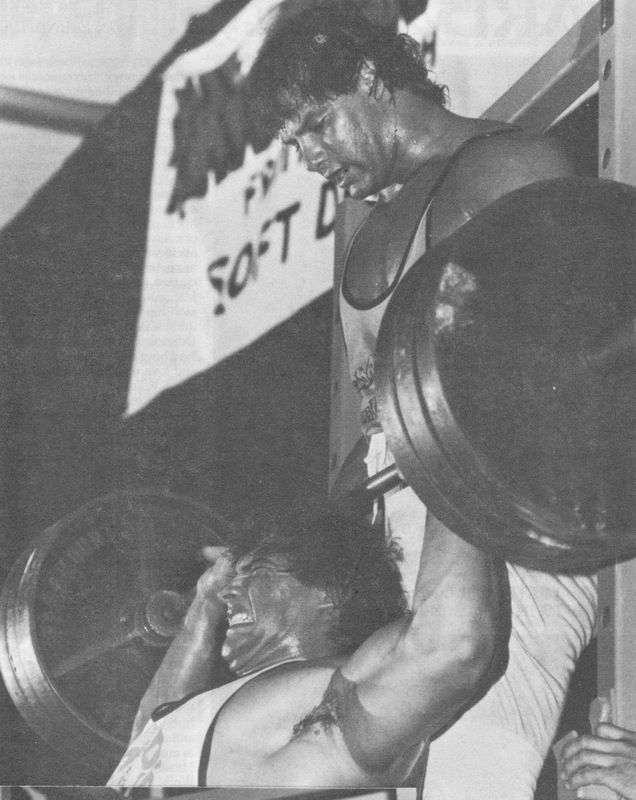 . . the Barbarians are a fresh new approach to the usual dribble that accompanies most up and coming bodybuilders. In essence, they are the Cheech and Chong of the Iron Game.